Solution: To install two α-ROBODRILL D21LiA5 and surround these with robot cells containing FANUC R-2000iB robots and product storage. Operators prepare the castings and place them on pallets. Robots bring the pallets to the machines and remove them. Using a FANUC vision system, smaller products are collected directly by the robots and placed on a conveyor. Result: Thanks to the higher volumes that we achieve through automation, Vullings needs to hire more staff. Reliability is essential to their operation. 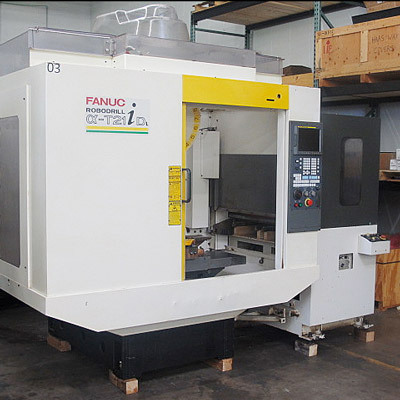 Not only do the FANUC machines provide this but FANUC controls also possess a machine state monitoring feature that the company uses to plan maintenance actions. The machines in the workshops of Vullings Metaalbewerking in Horst, Netherlands are running 24 hours a day. The choice of machines, production organization, CNC programs: Everything revolves around automation. Specifically, flexible automation, since even small series and unit products are manufactured in this highly automated work environment. Launched 10 years ago, this automation concept is now integrated into all business aspects and now deploys five robots. The machining centers are turning 7 days on 7 and 24 hours a day. During our visit, a ROBODRILL machine was busy making arms for Champion spraying systems. A FANUC robot picks the castings one by one from the feed conveyor and passes them to the machine. The optical system, positioned above the conveyor, tells the robot where the pieces are and how they should be picked up. Once machining of the spray arm is completed, the robot picks up the piece and places it on a discharge conveyor, where the optical system searches for a free space and tells the conveyor to provide one. Operators check that there are sufficient castings ready by the end of the day so that production may continue during the whole night. Vulling pays a lot of attention to preventive maintenance in order to ensure maximum machine availability. Frank Gijsen: "The FANUC controls possess a machine state monitoring feature that we use to plan maintenance actions. Each notification from the machine is taken seriously for the good of the machine and to ensure it that does not break down unexpectedly. Oil and tools are also subject to periodic monitoring." For the α-ROBODRILL D21LiA5, a robot (the M-20iA) was installed with the FANUC optical system integrated in the robot controller. In this cell, which deals with smaller products, the machine and the robot are fully integrated. "The machine controls possess enough computing power to run the cell. The robotized cell no longer needs a separate PLC,” explains Frank Gijsen. On delivery, the ROBODRILL was equipped with a FANUC tilting table and a rotary table so that the machine is capable of 5-axis machining. The machine controls allow the 5 axes to be operated simultaneously. The implementation of these 5 axes is a consequence of production without human intervention. At night, there is no operator to tighten the parts in a different position at intermediate machining stages. To succeed in this kind of flexible automation, and this is the lesson that Vullings learned, all aspects of production must be tailored to suit each other. Jeroen Evers: "When we receive an order for the production of a single piece, we see this as a series of one product. This means that if the same product would be repeated for a series greater than one unit, then it can be reproduced automatically. CAM programs not only contain the production parameters for the machine, but also the robot manipulation data. We consider automation from the start, allowing production cells to work in complete autonomy." Because automation concepts are largely implemented internally, the company manages to go further in its design, rendering an even more flexible production tool. Beside this, we make maximum use of the possibilities of the optical system and the computing power featured by FANUC controllers. Vullings likes to disseminate knowledge of flexible automation as widely as possible. To this end, company visits are organized, especially for students.